When BlackBerry CEO John Chen recently revealed that the Keyone won't be available until at-least May, no exact dates of its availability were mentioned. But now we know the European launch date at least. 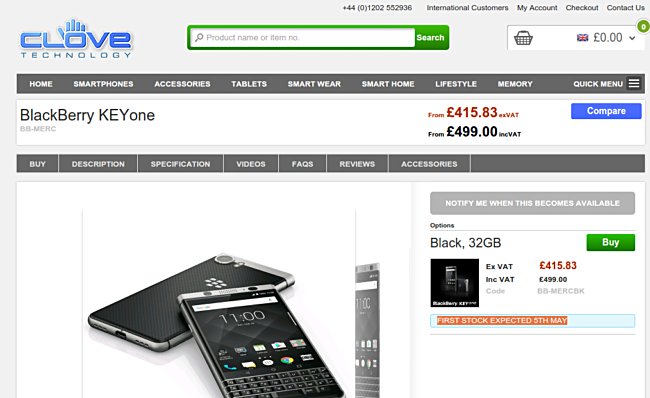 UK retailer Clove has the handset listed on its website, and the listing says "first stock expected 5th May." The phone carries a £499 price tag. Other European markets should also get the Keyone around the same time. No word on exactly when the US will get the device, although it's already FCC certified. Try rooting a BlackBerry droid device then. Tell us if you succeed.